If you could safely wade into a stream over 250 million years ago and peer down into the water you would have seen stonefly nymphs rummaging around the substrate. Stoneflies have changed little in appearance from prehistoric times. These primitive aquatic insects, distant cousins to the cockroach, have a loyal following with many fly fishers. Ardent hatch matchers target stonefly hatches on a national or even international basis. As fly fishers, we have attached unique nicknames to these prehistoric insects, Salmon Flies, Golden’s, Skwala, Winter Blacks and Yellow Sally’s to name a few. With over 600 species available worldwide, stoneflies come in a range of sizes and colors. Most species range between 3/8ths of an inch and 1-3/8ths in size, both nymphs and adults. Nymph patterns in size #10 through #4 4xl covers most situations. Adults mirror the same size range. Stoneflies are easy on your eyes at the tying bench. No micro sizes here! Nymphs grow through a number of molts, up to 30 times for some of the larger species. Gargantuan species such as the famed Pteronarcys, commonly referred to as Salmon Flies by most fly fishers, spend up to four years as a nymph. These robust nymphs grow to enormous sizes, often in excess of 2 ½ inches. Prospecting the depths with large gangly patterns is always a worthwhile endeavour on all Pteronarcys water. Golden Stones (Perlidae) are another species that reaches appreciable sizes. Looking at a stonefly nymph it is easy to see the link to their cockroach cousins. Nymphs feature three distinct thoracic segments giving them an armour plated appearance. As the nymphs near maturity their two wing pads are large, noticeable and worth imitating. It is important to note that the wingcase, pronotum (the segment between the head and wingcase) and head occupies half the body length, an important proportional goal post to consider at the vise. Stonefly antenna and tails are stout and in most species is at least half the body length. Some species such as Pteronarcys have long, almost flowing antenna and short tails. Stonefly legs, located at the base of each thoracic segment, are solid, well suited for crawling along the bottom. An important key stonefly identifier is the two claws located at the tip of each leg. These claws are unique to stoneflies. Recognizing the claws helps when sorting through a mix of small stonefly and mayfly nymphs which stoneflies are most often confused with, at least in the nymphal state. Tyers use a variety of materials to suggest the legs and antenna which are active when the nymph is adrift. Drifting adults also put their legs to good use when riding on the surface. In the past, goose biots and hackle were popular leg and antenna materials. Now long, active, rubber and Super Stretch Floss legs have become increasingly popular due to the tantalizing action they provide. Adults look like simple winged versions of their nymphal form. At rest the adults hold their wings flat along their back. At first glance you might confuse stonefly adults with caddis but the flat wing placement is a dead giveaway verses the tent-like profile of a caddis adult. Stonefly coloration varies by species. It is also affected by the habitat in which they live in as nymphs and the time of the year they emerge. Smaller stones that emerge during the winter months are dark, enabling them to absorb all available heat from the sun. Darker colors predominate but yellow, tans and bright green are not unheard of. Mottled color combinations are common such as the dark brown yellow scheme of Golden Stone nymphs. Recently molted nymphs are a pale yellow to almost white. They are conspicuous, and as with most aquatic insects a few pale versions to suggest a recently molted nymph are well worth a place in your fly box. A stonefly’s ventral surfaces are lighter than the dorsal surfaces. Some of the more complex patterns take this characteristic into account. Most stonefly nymphs breathe exclusively through cutaneous respiration, absorbing oxygen directly through their exoskeletons. Stonefly nymphs are not able to easily draw oxygen from the surrounding water. Water must be pushed or forced past them to breathe. As such they require high levels of dissolved oxygen and are only found in cool (44-55F) flowing water such as riffled rocky areas of streams, hence their stonefly name. 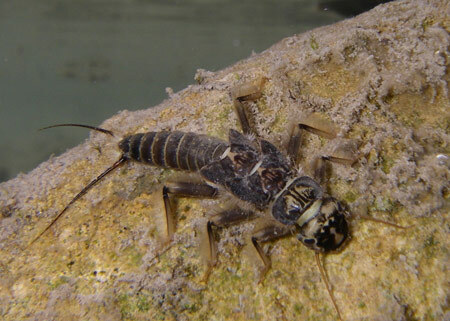 Cool fast paced water abounds in the west and explains in part why the majority of stonefly species are western based. The presence of stoneflies is key indicator of water quality. Their absence may be sign something is up. Stonefly nymphs left in standing water soon begin push ups so they can breathe. Some of the larger species augment their respiration process through prominent hair-like gills located at the base of the tail and at the base of their legs along the abdomen. On larger patterns these gills can be easily imitated. The late George Brooks, originator of the famous Brooks Montana Stone, used white ostrich herl to suggest the gills of the Pteronarcys nymphs his pattern was designed to imitate. Stonefly eggs sink and stick to the bottom rubble and debris. Within about 2-3 weeks for most species the eggs hatch and a new generation begins crawling about the bottom. A typical stonefly lifecycle runs approximately one year. Some species such as the large Pteronarcys or Salmon Fly take over three years to reach maturity. It is common for nymphs to inhabit one particular type of habitat only to move as they grow and mature. Most stoneflies are vegetarians but a few species such as Golden Stones (Perlidae) are capable carnivores. Their active prowling often gets them dislodged and in waters they are known to inhabit dead drifting a nymphal pattern is a good starting point. Proper stonefly nymph presentation dictates getting the fly down so it tumbles and drifts just above the bottom. Your nymphs should be ticking and hanging up from time to time, confirmation your nymph is in the right zone. Weighted patterns using lead wire, brass or tungsten beads are standard fare. Additional weight on the leader may also be required in swifter flows. These presentation requirements are taxing on the fly box. Use simple patterns. Loosing an uncomplicated pattern is not nearly as stressful as an intricate design that took more than 10 minutes to tie. From a practical perspective tying nymph patterns in the round is a wise approach. 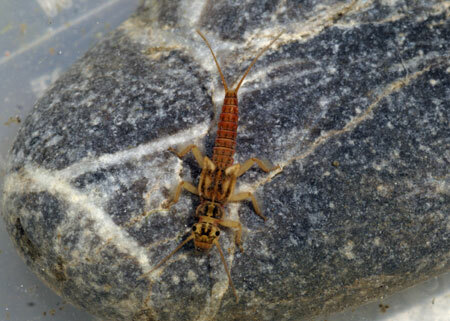 Stonefly nymphs are feeble swimmers. Dislodged nymphs tumble and wiggle until they touch bottom or disappear down the throat of an opportunistic trout. The in the round approach provides the same view from any angle and works well. Proven patterns such the Kaufman’s Stone, Brooks Montana Stone, Girdle Bugs and Pete Erickson’s Turd subscribe to this philosophy. Simple flies such as these are easy to tie, an important fact when presenting patterns properly in and amongst the rocks. Steelhead fly fishers know how important stoneflies are in the diets of juvenile steelhead and the imprint factor they have on the returning adults. A traditional Woolly Worm is a backbone fly for any steelhead fly fisher. Upon reaching maturity nymphs migrate in numbers toward the near shore shallows. Despite the large size some species attain they are quite adapt at staying hidden under the rocks and debris and out of the trout’s view. In many instances migrating nymphs offer the best chance for trout to focus on stoneflies. Turning over bank-side rocks and debris often reveals startling concentrations of staging nymphs. At this time staying out of the water and working the shallow reaches produces significant catches. If you have to wade do it carefully to avoid spooking fish. All stoneflies crawl out of the water to emerge. If you take the time to inspect shoreline vegetation and rocks during emergence time you often see the cast shucks, sometimes two or more piled on top of each other. Cast shucks are a prime indicator that working a nymph near shore or skipping and adult pattern through likely looking water is a worth a try. Males tend to emerge first. The males of many stonefly species, such as Skwala, are incapable of flight. Their wings are short, non functional, almost decorative in nature. A condition called brachyptery. Adult males scurry around the shoreline avoiding predators and searching for a suitable mate. 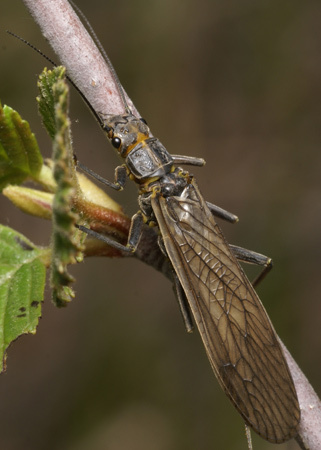 As the adults are capable of taking in water and eating plant materials mating does not take place right away as with other insects such as mayflies or midges. 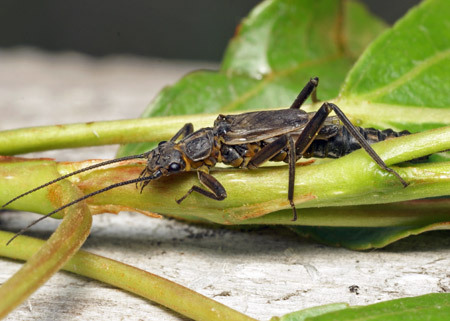 To attract a mate stonefly males produce a drumming sound using their abdomens. Potential suitors sense these drumming vibrations following them to their source. Once mated, pregnant females stop responding to drumming males. Mating typically takes place on the ground or the vegetation within a week of emergence. Stoneflies do not mate in the air. Gravid females take flight, returning to the river to lay their eggs. Some species crawl beneath the water to deposit their eggs while most skip and flutter above the water in an awkward clumsy ballet. Each time the female touches the water she releases a portion of her egg cargo. Low light conditions are favoured egg laying times. On some rivers getting on the water before first light and pounding the banks provides unbelievable action. Trout, tuned into the winged bounty, remain tight to the banks until the light of day or wading anglers herd them out into deeper water. This egg laying ritual stirs cautious trout into a crazed frenzy, slashing the egg laying females as they hit the surface. Trout take the fly dead drift or on the swing. If you are using rubber legged patterns twitch the pattern a few times through the drift to draw trout to your fly. Takes to adults are seldom subtle and they are often heart stopping. This activity also imprints itself on steelhead. Returning adults recalling scenes of their youth smash drifting or skating adult patterns with reckless and persistent abandon. Understanding the stonefly life cycle, pattern imitations and the presentation skills to use them are something every river and stream angler should know, both trout and steelhead fly fishers. Stoneflies are in important component in the diets of trout and juvenile steelhead. Their presence on and in the water can create intense feeding frenzies or trigger a latent response. Coupled with their large average size stonefly imitations provide a source of angler confidence as well. After all, who doesn’t like their indicator dragged to the depths or watch their dry fly disappear in an explosion of water!